Cliff Latham’s settled aesthetic gets shattered when a young and talented woman, his neighbor, pays a visit to his studio looking for guidance and mentoring. with Joey Hoeber, Jude Haukom, and Claudia Rosa. 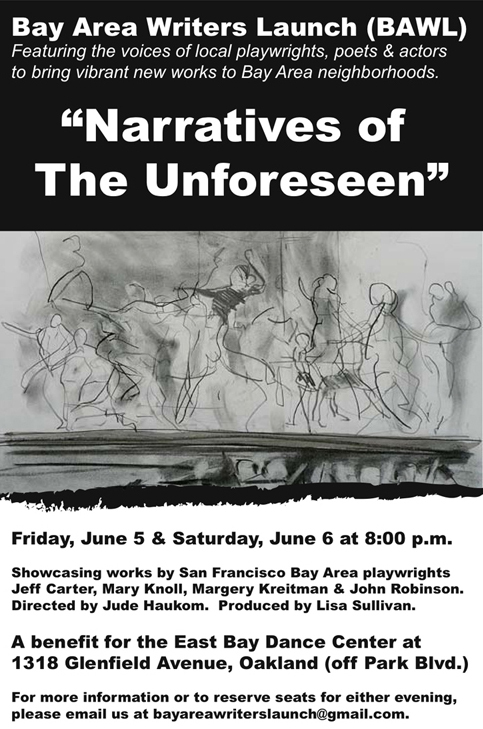 For tickets visit the SF Fringe website. Read more about John Robinson here. August 7, 2009 through September 6, 2009. Fridays and Sundays only! Fridays at 7pm, with restaurant service starting at 6pm. Sundays at 5:30 pm, with restaurant service starting at 5pm. The People’s Theatre at Pena Pachamama restaurant, 1630 Powell, San Francisco. Restaurant’s menu online. Call 415-259-1623 or email Mary Knoll. Please visit the Theatre You Can Eat website. The mind’s preoccupation with unattainable love disturbs the pleasure of morning coffee. A tourist headed east finds himself in a forgotten mountain village. The museum management is surprised by an unexpected exhibit. Two part time teachers help a lost man find his way home. A drama lover returns to his beloved San Francisco to search for his favorite theatre. But, alas, it is defunct. Or is it?